"Listed are only events that solely occurred on command of church authorities or were committed in the name of Christianity. (List incomplete)"
As soon as Christianity was legal (315), more and more pagan temples were destroyed by Christian mob. Pagan priests were killed. According to Christian chroniclers he "followed meticulously all Christian teachings..."
The world famous female philosopher Hypatia of Alexandria was torn to pieces with glass fragments by a hysterical Christian mob led by a Christian minister named Peter, in a church, in 415. 16th and 17th century Ireland. English troops "pacified and civilized" Ireland, where only Gaelic "wild Irish", "unreasonable beasts lived without any knowledge of God or good manners, in common of their goods, cattle, women, children and every other thing." One of the more successful soldiers, a certain Humphrey Gilbert, half-brother of Sir Walter Raleigh, ordered that "the heddes of all those (of what sort soever thei were) which were killed in the daie, should be cutte off from their bodies... and should bee laied on the ground by eche side of the waie", which effort to civilize the Irish indeed caused "greate terrour to the people when thei sawe the heddes of their dedde fathers, brothers, children, kinsfolke, and freinds on the grounde". "Note: All figures according to contemporary (Christian) chroniclers. 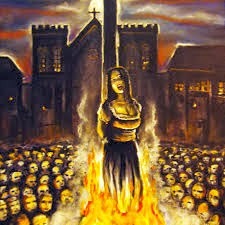 Already in the 4th and 5th centuries synagogues were burned by Christians. Number of Jews slain unknown. 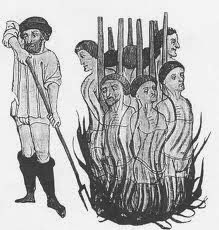 1391 Seville's Jews killed (Archbishop Martinez leading). 4,000 were slain, 25,000 sold as slaves. [DA454] Their identification was made easy by the brightly colored "badges of shame" that all jews above the age of ten had been forced to wear. 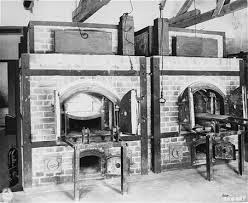 "(I feel sick ...) this goes on and on, century after century, right into the kilns of Auschwitz. Beginning with Columbus (a former slave trader and would-be Holy Crusader) the conquest of the New World began, as usual understood as a means to propagate Christianity. "Of course no different were the founders of what today is the US of Amerikkka. 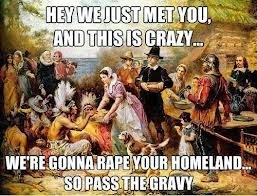 When however, a dead colonist was found, apparently killed by Narragansett Indians, the Puritan colonists wanted revenge. 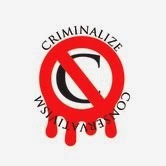 Despite the Indian chief's pledge they attacked. Somehow they seem to have lost the idea of what they were after, because when they were greeted by Pequot Indians (long-time foes of the Narragansetts) the troops nevertheless made war on the Pequots and burned their villages. "Surpisingly few know that Nazi extermination camps in World War II were by no means the only ones in Europe at the time. In the years 1942-1943 also in Croatia existed numerous extermination camps, run by Catholic Ustasha under their dictator Ante Paveli, a practising Catholic and regular visitor to the then pope. There were even concentration camps exclusively for children! "Diem saw to it that U.S. aid, food, technical and general assistance was given to Catholics alone, Buddhist individuals and villages were ignored or had to pay for the food aids which were given to Catholics for free. The only religious denomination to be supported was Roman Catholicism. "'Individuals considered dangerous to the national defense and common security may be confined by executive order, to a concentration camp." "Supposedly to fight communism, thousands of buddhist protesters and monks were imprisoned in 'detention camps.' Out of protest dozens of buddhist teachers - male and female - and monks poured gasoline over themselves and burned themselves. (Note that Buddhists burned themselves: in comparison Christians tend to burn others). Meanwhile some of the prison camps, which in the meantime were filled with Protestant and even Catholic protesters as well, had turned into no-nonsense death camps. It is estimated that during this period of terror (1955-1960) at least 24,000 were wounded - mostly in street riots - 80,000 people were executed, 275,000 had been detained or tortured, and about 500,000 were sent to concentration or detention camps. [MW76-89]. 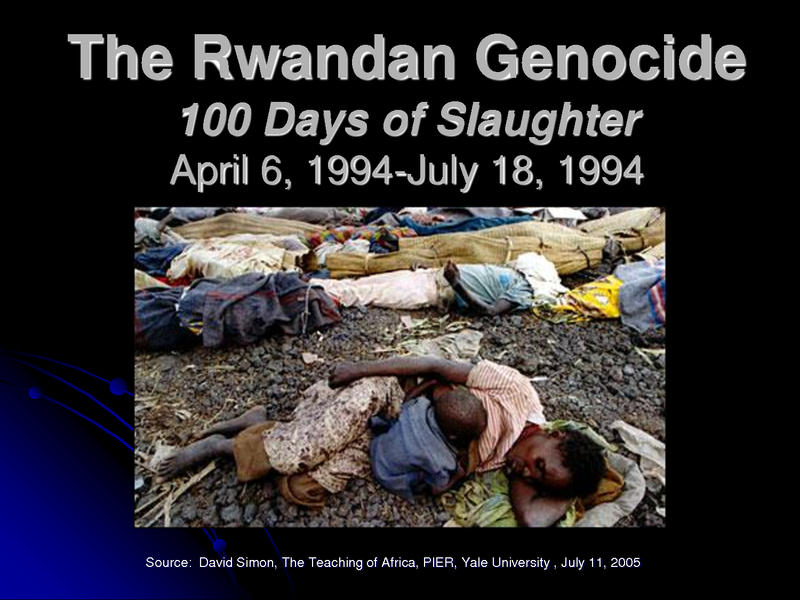 "In 1994 in the small african country of Rwanda in just a few months several hundred thousand civilians were butchered, apparently a conflict of the Hutu and Tutsi ethnic groups. "For quite some time I heard only rumours about Catholic clergy actively involved in the 1994 Rwanda massacres. Odd denials of involvement were printed in Catholic church journals, before even anybody had openly accused members of the church. "As can be seen from these events, to Christianity the Dark Ages never come to an end...."
K.Deschner, Abermals krhte der Hahn, Stuttgart 1962. K.Deschner, Opus Diaboli, Reinbek 1987. P.W.Edbury, Crusade and Settlement, Cardiff Univ. Press 1985. S.Eidelberg, The Jews and the Crusaders, Madison 1977. 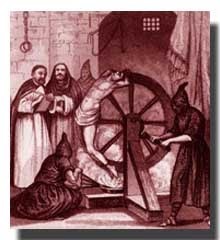 H.C.Lea, The Inquisition of the Middle Ages, New York 1961. M.Margolis, A.Marx, A History of the Jewish People. A.Manhattan, The Vatican’s Holocaust, Springfield 1986. See also V.Dedijer, The Yugoslav Auschwitz and the Vatican, Buffalo NY, 1992. J.T.Noonan, Contraception: A History of its Treatment by the Catholic Theologians and Canonists, Cambridge/Mass., 1992. Newscast of S2 Aktuell, Germany, 10/10/96, 12:00. D.Stannard, American Holocaust, Oxford University Press 1992. German news magazine Der Spiegel, no.49, 12/2/1996. F.Turner, Beyond Geography, New York 1980. H.Wollschlger: Die bewaffneten Wallfahrten gen Jerusalem, Zrich 1973. (This is in german and what is worse, it is out of print. But it is the best I ever read about crusades and includes a full list of original medieval Christian chroniclers' writings). "This page 1996 by kelsos. So there." If these lists made you sick, you're not alone. The staggering fact that the lists are incomplete is even more mind-boggling. 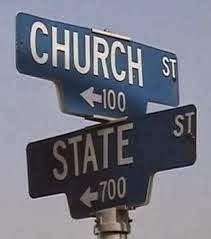 Our Founding Fathers were well aware of what happens when the wall between Church and State tumble down and Jefferson's "wall of separation between church and state" was erected to prevent the evil that religious political power brings with it. Few people know the history of the Wall outside of the American experience, and the article on Separation of Church and State at Wikipedia is a fascinating read for anyone interested in the history of Church and State around the world. 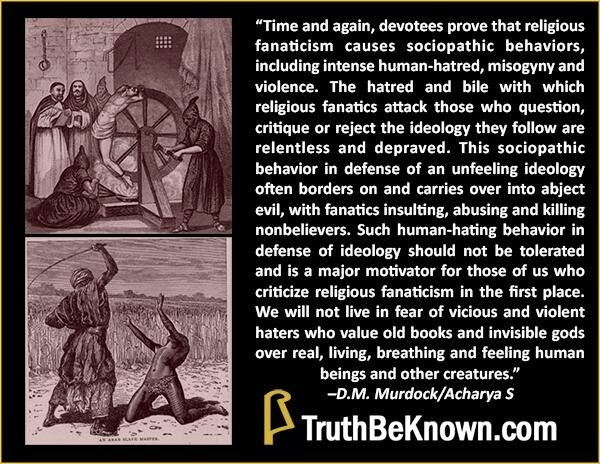 Whether Christian or Muslim, absolute religious power in the polity always leads to murder and torture and anyone calling for America The Christian Nation should be locked up until they're safely dead. 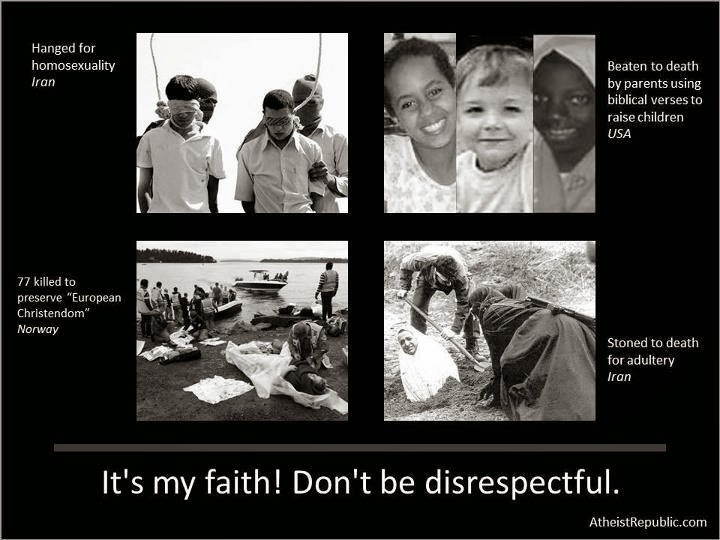 We posted a story about a month ago for those who think religious violence is a thing of the past called, "Humanity Is Becoming Increasingly Less Violent, with One Exception -- Religious Violence," and if you missed it we recommend that you read it now, because religious violence around the world is once again on the upswing. No, Virginia - America is not a Christian nation, it is a democratic one, and all those professing the contrary are not only anti-American, they should also be branded as criminals.